Like any other athlete, when cyclists are riding hard in the saddle all day long, it’s important to keep hydrated and to keep your carbohydrate levels up. If you’re out for a leisurely ride and a bit of relaxing sightseeing, then you can get away with a bottle of water, but if your riding involves pushing your body to its limits, then water alone will not be enough. You need to keep up your fluids by drinking a performance drink. 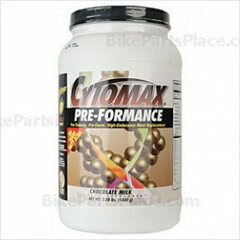 And one of the best performance drinks out on the market today is the specialty range of CytoSport bike drinks. If you are going to be serious about your bike riding, then you are going to need the energy to keep you at your peak performance while you’re sitting in the saddle. There are many foods and vitamins available that you can take in order to boost your energy levels. Protein bars, such as the nutritious range of Clif Bars are a great way to sustain your all-important energy levels over long periods of riding – whether you are competing at elite level or just going for a long, pleasant ride with friends.